Speaking of comments, Becky O. left one on Friday pointing us to this WONDERFUL writeup by TrueUp about the different on-demand fabric printers. Exhaustive and well-researched, definitely worth checking out. Kate found the button-top (not dress) I was thinking of. Great for Rolling Stones fans! Anna sent me a link to The Sewing Machine Attachment book. (It's a book about different attachments FOR your machine, not about fostering your attachment TO your machine.) I have purchased mine, will review when I get it! Lucy (who is the person behind Home Movie Day London) sent this link to a digitised (British spelling, in Lucy's honour) film of 1930s fashions. Lovely! OK, so heres a thing I love: becoming a fan of something on Facebook that has less than 10 gajillion other fans. Im elitist like that. The fact that its something cool, no wait SUPER SUPER SUPER COOOOOL like Worknik. Well, thats just icing. OK, I think Wordnik is super super super cool.Worknik on the other hand sounds suspiciously like something my comrade in Siberia thinks I should be once I get to the gulag. So no, not so super cool sounding. Inventress? Okay thats a new one for me – is that a real word? What a lot of cool links. I love how you provide all these neat things I like to look at, without my having to search for them. Those garments knitted from trash–just the kind of thing I wish I had done in art school! Unfortunately, if she patented any of her inventions, Google Patents ( http://www.google.com/patents )has mangled crucial information in the optical conversion of the patent documents to electronic text. I couldnt find any matches for combinations of terms like Norman, St. Louis, Missouri, dressmaking, 1893, etc., that would seem to be for her inventions. However, searching for dressmaking and sorting by older patents first does yield the work of some other inventive women and men of her day. Maybe this tailors square is the only thing she invented? Fabulous graphic. Mrs. Normans pattern is actually a giant sewists Ouija board. Quick! Erin! Delete this post or all of our mystical powers will be revealed! Help – I hope you or a reader can solve a question I have regarding a Simplicity pattern line (they dont seem to know the answer). Im wondering what the origination was for the pattern line of the 1990s known as Maren dress? This would be a womens line – separates as well as dresses I believe. Many thanks. I have a book Cutting a Fashionable Fit by Claudia B Kidwell. Published by Smithsonian Institution Press, 1979. Mrs. N. R. Norman is mentioned; Her publications are listed from 1878 to 1896 (4 publications listed, all privately printed), but its not clear which one this is. It does say that the State of Origin is Missouri and that the clothing types were Men, Women and Children. Maybe that will help the research! 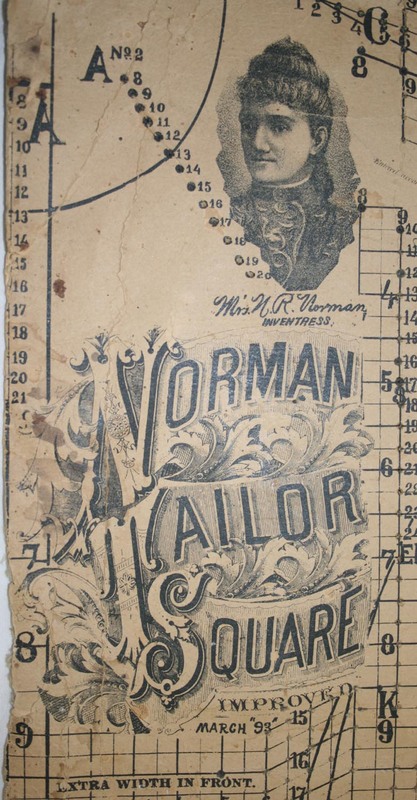 Thanks to Erin for posting the Norman pattern and thanks to everyone for the helpful comments! I have Kidwells book in hand(thank you inter-library loan!) and the link to the auction was surprisingly helpful. I still dont have a lot of info, but Im getting a good start. Thank you!